← Why should we care about bats? 1) Installation Height: 4 to 6 metres high is a good height to install the box. Any lower than 4 metres and ground predators (like cats) could climb and eat the bats. Rats are generally no problem because the entrance gap for the bats is far too small for them to enter. The same with all birds. They are unable to enter. 2) Orientation: Between North-West and South. Preferably East. The bats require part shade part sun. Generally in the morning the boxes warm up with the sun and by the afternoon they should be in the shade. 3) Air space below box. 2m x 2m x 2m air space under the box. This is for the bats to swoop in and out. They are a little like aircraft and require take off and landing space. Past experience has proven that any obstructions immediately below the box will deter the bats. 4) Reasonably quiet location. High frequency sounds such as steel chains clanking can really disturb the bats. Chain saws and other electric and power garden tools don’t seem to upset them. 5) Location: The boxes can be installed on trees or houses. In fact the bats find them quicker if they are mounted on a house. By instinct they seem to know that human habitat offers them great housing. The older the house the better. 6) Inspection. To see if you have any bats in the box, just stand directly below the entrance, briefly shine a torch up and look at the inner rear wall. The bats will sometimes cling to the mesh and you can see a definite black blob hanging in there. Don’t hold the torch for really long periods because if the bats are awake they will not like the light. Contrary to popular belief the bats are not blind and can see. 7) Arrival: When will they arrive? Depends on several factors. Timing. Bats generally shut down over winter and aren’t exploring as much as Spring , Summer and Autumn. They are extremely curious and always looking for new homes. Looking for a new place to roost takes lots of energy and this happens when the temperatures are warmer with plenty of insects around for food. Existing Population. If there are bats in the area they will find it quicker. Once one finds the box it will go and tell its mates. Water. If you are within 4 to 10 kilometres of a water body such as lake, river or large body of water they will come faster. Surprising enough micro bats do come down to swimming pools to drink. Bushland– If you are close to some type of natural bushland it increases your chances of attracting the bats. This has to do with the amount of insects that come out at night from these areas. Bats have been recorded arriving within two months to three years within the metro area. Patience is the key. 8) Pray: Don’t give up!!!!!! When you think it hasn’t worked something will happen. As humans we live in a world of instant gratification. The animal kingdom doesn’t live by these rules. Time will work for you and not against. Waiting for bats is a little like having a religion. You have to keep the faith, results are not always immediately obvious, these creatures are dark, mysterious and not easily seen. Retired Veterinarian in bush setting on Sunshine coast near dam. 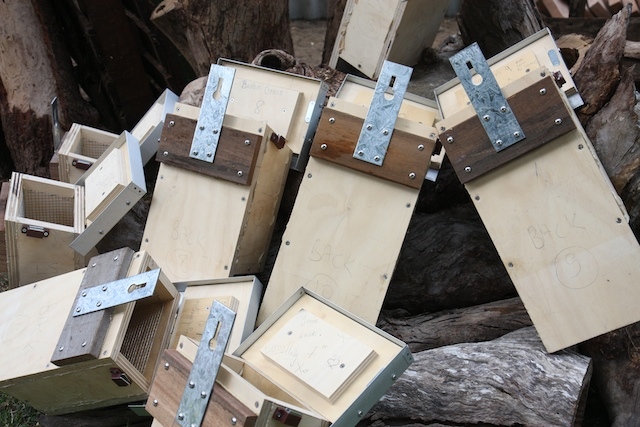 Have seen microbats, intend putting up nest boxes. Are they territorial & what spacing between boxes? Micro bats aren’t territorial. In fact, several species can share the same box. Even huntsman spiders and geckos share the same space. They could teach us a thing or two how to live together. Put up more than one box. They like to move between boxes. Keeps the predators guessing??? We have just made and placed our micro bat box. Very exciting. Thanks so much for the information.